This article was originally published on my WordPress blog – May, 2014. Weimar and the Ettersberg, from Conti-Atlas für Kraftfahrer (c 1935). It’s strange what evidence of history you can find in banal, everyday objects. On an impulse, years ago, I bought an old road atlas of Germany in a secondhand bookshop. To judge from internal evidence, Conti-Atlas für Kraftfahrer (‘Conti-Atlas for the Motorist’) was published in about 1934, because it lists new designs of road signs that would come into use in Germany from 1st January 1935 (1). The Conti-Atlas was designed in a bright, modern fashion for its day, with clear road maps and an appendix that listed cities and towns across Germany, 140 of them illustrated with streetmaps. The names that are given to streets, squares and other public spaces reflect both the past and the present. Even a cursory glance at the streetmaps in the Conti-Atlasreveals chilling evidence of the increasing grip of the Nazi party on German daily life in the year or so after Hitler became Chancellor in 1933. A more detailed analysis of the streetmaps shows just how far this had gone. Because the maps focus on town centres, they won’t include many suburban streets, and of course the analysis doesn’t cover places that did not have maps published in the Conti-Atlas. However, the roadbook featured plans of all the big German cities and towns, and quite a few of the smaller ones, so I think the results are reasonably representative. Seventy-six of the 140 places did not seem to have any streetnames related to Nazism, though quite a few had names that celebrated the recently-deceased Field Marshal Paul von Hindenburg, the commander of the German army in the First World War and German President when Hitler came to power in 1933. The 64 other towns and cities all had roads and other features named after Hitler, Hermann Göring and the Nazi ‘martyr’, Horst Wessel. Unsurprisingly, ‘Hitler’ names were the most common, linked with ‘strasse’ 44 times and ‘platz’ in a dozen other instances. By renaming the old streets and squares of their towns, Nazi supporters were both trying to curry favour with the regime and underline its growing dominance. 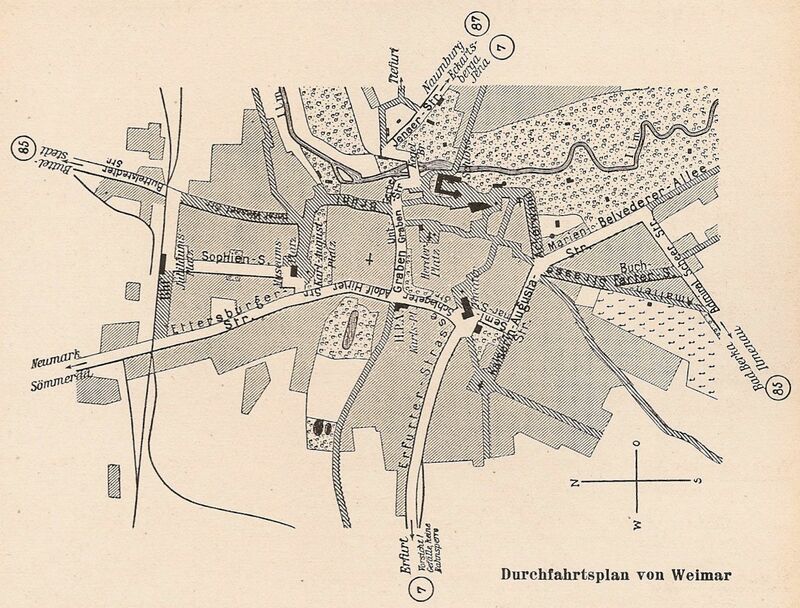 Street-plan of Weimar from Conti-Atlas für Kraftfahrer (c 1935). Adolf Hitler Strasse (printed upside-down) and Ettersburger Strasse are shown the left of the city centre. 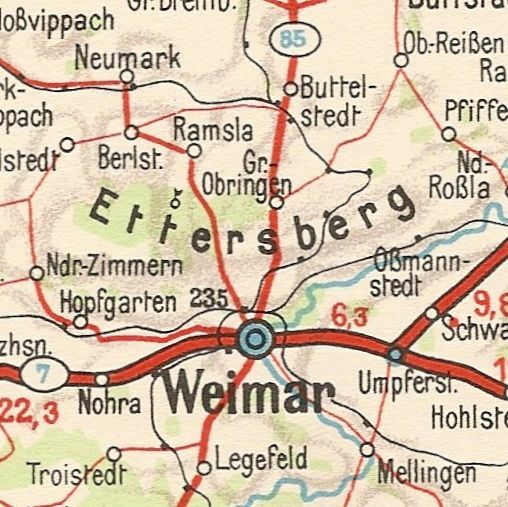 The town of Weimar, featured in the Conti-Atlas map above, was the home of Goethe, the place where Germany’s 1919 constitution was promulgated (hence ‘Weimar Republic’) and a famous centre of German culture. By the mid-1930s, very dark times had come to Weimar. Its new Adolf Hitler Strasse led north from the town centre to Ettersberger Strasse, which ran to the Ettersberg mountain. In 1937 the SS made a clearing in the forest on the Ettersberg and built a concentration camp there, Buchenwald. Initially it was used for German inmates – Jews, Gypsies, Communists, Christians, gays, intellectuals or others, people seen by the regime as either inferior or as political enemies. Later, it became the biggest concentration camp in the German Reich, and provided slave labour for the German arms industry. By the time the US Army liberated it in 1945, over 56,000 people had been murdered in one way or another in Buchenwald and its many sub-camps (2). Following the war, the new Communist East German regime renamed Adolf-Hitler Strasse as Ernst-Thälmann Strasse, after the German Communist leader killed at Buchenwald in 1944. For five years, the old concentration camp became a Special Camp run by the Soviet secret police, the NKVD. It was used to detain former Nazis and others, and some 7,000 more people died there. At a time when many overtly nationalist parties have achieved significant victories in the European elections, and the Crimea has been annexed by Russia, it’s worth remembering what happened the last time Europe pulled itself apart. The new streetnames in the Conti-Atlas are a reminder that events can take a turn for the worse very quickly. And, as the Conti-Atlas shows, the road to Hell can be well-signposted. (1) Conti-Atlas für Kraftfahrer. Deutschland 1:50000 Mit Den Reichskraftfarhrbahnen, Continental Cauotchoc-Compagnie G.M.B.H., Hannover. (2) http://www.buchenwald.de/en/69, Buchenwald and Mittelbau-Dora Memorial Foundation, accessed 27 May 2014. Ian Friel is a historian, researcher and author with over 40 years experience and an international reputation in the field of maritime history.